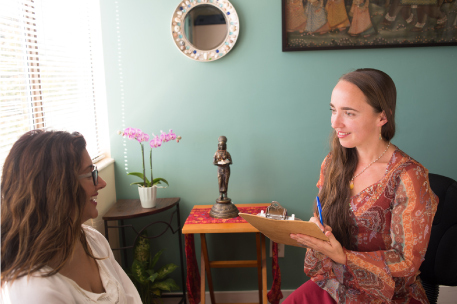 During your first Ayurvedic Consultation we will meet for approximately 1 ½ hours. The Ayurvedic Consultation includes a thorough health intake, evaluation and pulse analysis to determine your unique constitution (Vata-Pitta-Kapha body type) according to traditional Ayurvedic principles. Based upon this, specific recommendations will be offered around lifestyle, nutrition, herbal supplementation, yoga & exercise, cleansing and color/sound/aroma therapy. Your 45-60 minute follow up appointment is included and will be scheduled within 2-6 weeks of your first consultation. Similar to above description. We will set one 90 minute appointment for your initial consultation and one 45-60 minute follow-up consultation within 2-6 weeks. New Clients Ayurvedic Consultations — please print and fill out the Ayurvedic Intake Form ( Intake Form ) and bring it with you to your appointment.